Recently I spotted a collection of (delightfully) exasperated messages from workmates and roommates to their um… workmates and roommates. 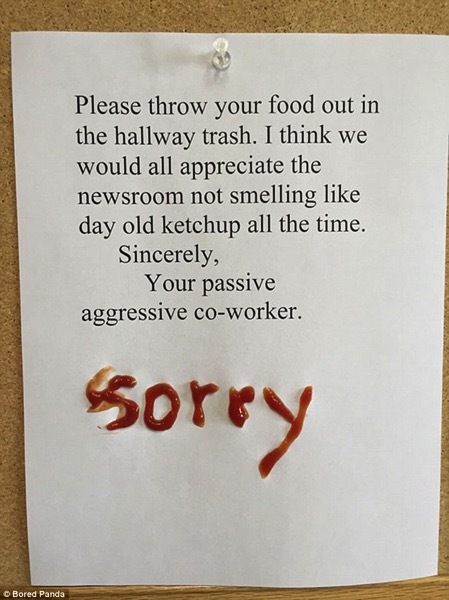 Here is one that caught my eye, but then writing in ketchup tends to draw the eye! The Cat is one of the most successful feline authors in the history of Catkind. His sharp elegant wit has produced the bestselling book ‘Getting Out – Excerpts from a Cat’s Diary’ and of course the much plagiarised gag of the same name which appears on all of the funniest joke sites on the internet. Happily soon ‘Getting Out – Excerpts from a Cat’s Diary’ will be available in China, aren’t the Chinese lucky!